In this blog, I will show how to read IIS logs to get meaningful information using SQL like language. I would be using the free tool LogParser. A typical log file would contain a line which starts with #Fields:. This line will tell the sequence in which above fields are logged. You can consider this line as the table columns. Every subsequent row would be filling values in these columns. This command is telling the parser to look at IIS logs, run the sql MaxTime.sql on those logs and output the results to results.csv. This sql is selecting the top 50 log entries which have highest time-taken averages. The time-taken consists of time the request was in queue, time to execute and time to client. 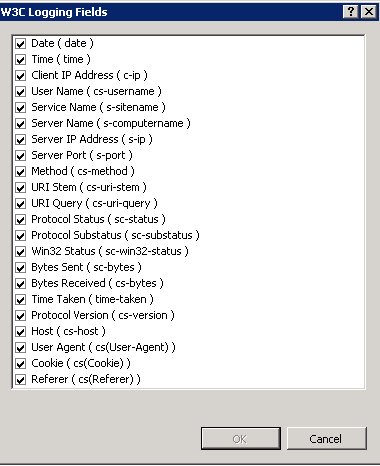 IIS only processes a certain number of requests at any time, hence the other requests get queued. If you open the results.csv you will see something similar to the image below. I have removed the URIs. 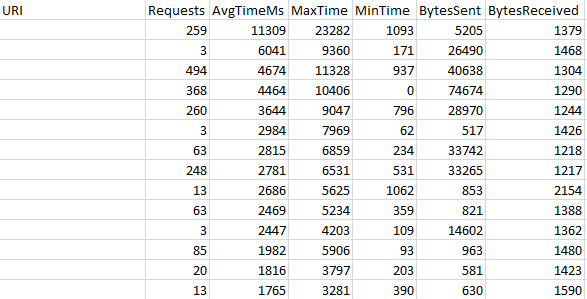 We can create our own set of such SQLs and generate performance data based on these logs.